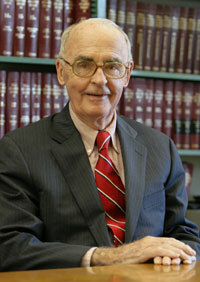 Edward B. Corcoran is senior counsel to Corcoran, Peckham, Hayes, Leys & Olaynack, P.C. His practice is focused in matters of Estate Planning, Wills, Trusts, Asset Protection, Probate and Real Estate. He was born in Newport and graduated from Brown University and Columbia Law School. He was a member of the Middletown Town Council from 1976-1987 and was its President from 1982-1987. He also served as Middletown Town Moderator, as Town Solicitor for the Town of Middletown and as a member of the Town of Middletown Zoning Board of Review. Mr. Corcoran is extremely active in local charitable organizations, most notably as co-chair with his wife, Ruth, of the Newport Hospital Vision 2001 Capital Campaign. He also received the inaugural Harold B. Soloveitzik Professional Leadership Award from the Rhode Island Foundation for his civic and charitable efforts.